Garden and power tools often have sharp blades or cutters that operate at a high speed. Like any other tool, they can cause injury if they are not used correctly so before using such tools, you should always read the instruction manual. 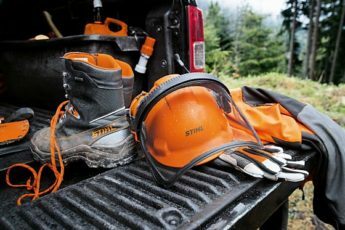 If you haven’t used that type of tool before, ask your local STIHL dealer to show you how to operate the machine – they can give you guidance on the correct use of the tool before you start. Whilst correct use will minimise the risks associated with using power tools, Personal Protective Equipment (PPE) can reduce the risk of serious injury even further. The instruction manual for your tool will give details of what PPE you should wear when operating the tool – you should ALWAYS follow the recommendations, they are there for a reason and it’s not difficult to find examples of injuries sustained by people who don’t follow these recommendations online. So check out our handy Personal Protective Equipment guide below for more information about what PPE you should wear with what tool. Make sure your clothing is sturdy and snug-fitting but not constricting – you need to have freedom of movement when you are using the tool. You should avoid clothing that could get caught on branches, trees or bushes or moving parts of the machine, such as scarves, neckties or jewellery. Don’t forget your hair too – if you have long hair you should tie it up or out of the way. Make sure you wear appropriate ear protection when using any petrol machines and some electric machines. These tools are much noisier than battery-powered tools so ear protection is really important. Consider the sound pressure level of the tool you are using and the SNR (Single Number Rating) of the ear defenders attached to the helmet. Our battery-powered tools are quiet enough that you don’t need to wear ear protection as standard so consider battery power if you are concerned about noise levels. Chainsaws have very high chain speeds. 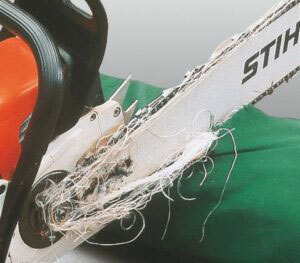 No PPE can ensure complete protection against cutting from a chainsaw. But it is possible to offer a certain degree of protection, which could mean the difference between a nasty gash and a more serious injury so PPE is a must. Chainsaw trousers with cut protective inserts. 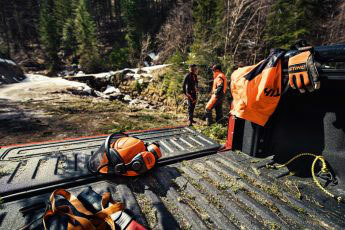 The cut protective material in chainsaw trousers is full of individual fibres – if a moving chain comes into contact with the blocking material, the saw rips out the fibres which block the sprocket and eventually stop the saw. The most advanced chainsaw trousers in our range are our ADVANCE X-Flex trousers, which are lightweight, flexible, breathable but also durable. These trousers are a STIHL exclusive design and are available in both Design A (cut protection on the front only, suitable for professionals familiar with working with a saw on the ground) and Design C (protection on the front a nd back of the leg, which should be used when working at height with a chainsaw and by those unfamiliar with using a chainsaw). To reduce the risk of eye injuries, you should wear safety glasses. Visit your local dealer to try these on – they need to be a good fit to avoid gaps round the edges where flying debris could reach your eye. On top of goggles, you should also wear a well-fitting face shield. If you are working in an area where there is a risk of falling objects, you should wear a safety hard hat or helmet. 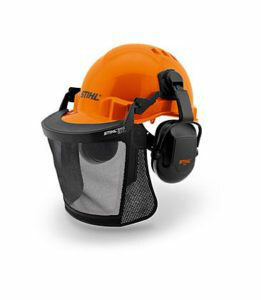 STIHL make helmets which come with attached visors and ear defenders, such as the Function Basic. Wear heavy-duty work gloves made of durable material (e.g. leather). The Protect MS FUNCTION gloves have cut protection patches on the back to protect your hands. Don’t forget, you should also wear ear protection if your chainsaw is petrol or electric. 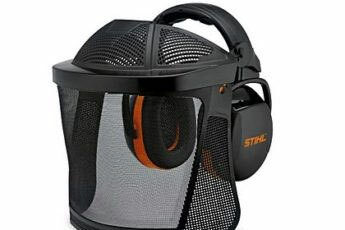 Ear protection isn’t necessary if you are using a STIHL cordless chainsaw as they are so quiet! Wear sturdy shoes with non-slip soles. Standard safety boots, such as the WORKER S3 boots, with a steel toe cap are ideal. You should also wear safety glasses when using a hedge trimmer – small cuttings and leaves can easily cause damage if they come into contact with your eye. Heavy-duty, but well-fitting, work gloves made of durable material should also be worn. Again, ear protection should be worn when working with petrol and electric tools, but are not needed with STIHL cordless hedge trimmers. Wear steel-toed safety boots with non-slip soles, like the WORKER S3 boots. Getting grass in your eye is extremely painful so you should wear snug-fitting safety glasses and a face shield to reduce the risk. Both need to be a good fit so take a trip to your local dealer to try these on before buying. Ear defenders or ear plugs should be worn if you are using a petrol or electric grass trimmer, but our STIHL battery-powered grass trimmers are quiet enough that you don’t need ear protection. Finally, you should wear heavy-duty work gloves made of a durable material.